According to my family, I’m the best pie maker in the world! They’ve voted my Cherry Kool-Aid Pie as the coolest and refreshing pie they’ve ever tasted. I actually blushed from all the compliments AND knowing how easy it was to create my pie using Kool-Aid Easy Mix. My daughter has already requested it for her birthday in August. Since making this pie, I have ventured out and made several Kool-Aid Pie Recipes. I’ve enjoyed Kool-Aid ever since I was a child. I always looked forward to summertime and VBS because each day we had a different Kool-Aid flavor to go along with our cookies. Don’t tell anyone, but snack-time was my favorite part of the day! 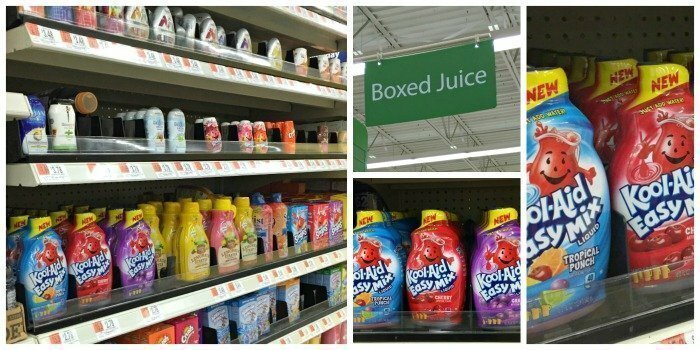 If you take a peek in my pantry, you’ll always find a few packages of Kool-Aid, so I was really excited when I found the new Kool-Aid Easy Mix at my local Walmart. Y’all, it’s a liquid drink mix and comes in grape, cherry, and tropical punch! The packaging is so cute and colorful and it’s easy to use – you just open and pour. I also like how affordable it is! You can make it by the pitcher or by the glass AND it has 50% less sugar than leading sodas. I scooped up all 3 flavors before gathering the rest of the ingredients for my Cherry Kool-Aid Pie. My 5-ingredient no-bake pie can be whipped up in mere minutes, placed in the fridge for an hour OR overnight and it’s all set. You’ll need a graham cracker pie crust, 8 oz. 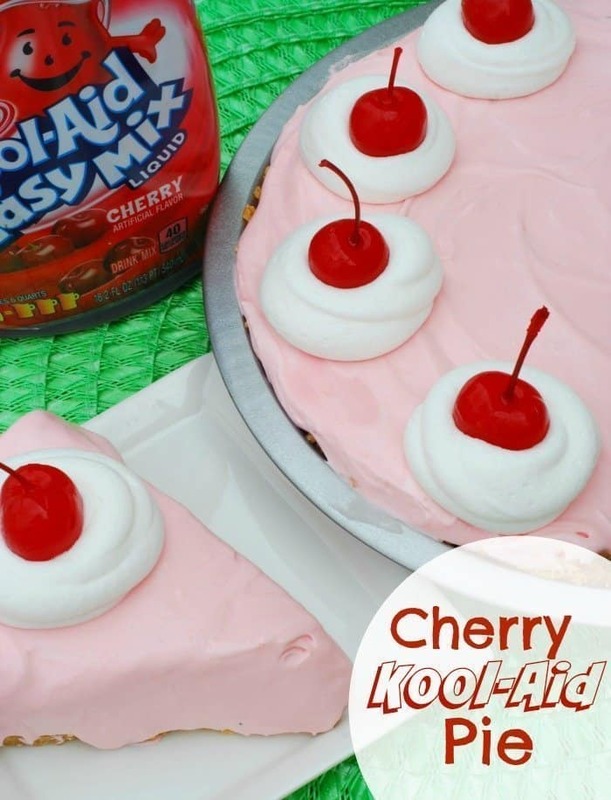 Cool Whip, 1/4 cup Cherry Kool-Aid Easy Mix, sweetened condensed milk and an 8 oz. block of cream cheese. After the slight delay of making a new crust, I added the cream cheese and sweetened condensed milk into the bowl of my electric mixer and mixed until well blended. Then I added the Kool-Aid Easy Mix and mixed on low speed. Add the Cool Whip and mix some more! Spoon the mixture into the crust and it’s ready to rest in the fridge for an hour (or overnight). I topped the pie with mounds of cool whip and maraschino cherries with stems. The cherries were blotted well with paper towels so they wouldn’t bleed into the topping. You may want to make two pies. This one sure didn’t last very long at my house. I’m thinking of making the next one with the tropical punch flavor. Combine the cream cheese and sweetened condensed milk in a bowl. Mix with electric mixer until well combined. Add the Kool-Aid Easy Mix and mix well. Add the Cool Whip and mix on low until light and fluffy. Spoon mixture into pie crust and place in the fridge for at least an hour. What’s your favorite summertime pie? When you’re talking cream cheese and a graham cracker crust, the rest is just destined to fall into place. I’d love to have this right after a day out shopping but BEFORE dinner. 🙂 …along with a creamy cup of strong coffee. I’ll certainly join you for pie and coffee! This is what I’d call happy food. Just look at that, I love it and it looks so good. I like how you incorporated Kool Aid into this pie, it’s something new and it looks so pretty too! Imma do this at home. I’m sure it will be a hit. I totally agree on the happy food. Every time I see Kool-Aid, I have to smile. I remember that huge Mr. Kool-Aid and that pitcher. I always get warm, fuzzy feelings when I think about Kool-Aid. Lacey Charrene recently posted…How to Guide: From Couch to Running! It really is good and so, so easy. I have used Kool-Aid for many things, but haven’t tried making a pie with it yet. I have colored Easter eggs with it. Oh, what fun! Thanks for the tip on coloring eggs with Kool-Aid. I’ll have to try it next Easter. You had me at the first picture! It looks beautiful! Thanks, Amy! I was well pleased with how it turned out. That sounds so good! This is really my dream pie. Yum! Everyone in my family loves it! Kristen from The Road to Domestication recently posted…Growing a Gardener: How to Garden with Your Kids! Oh Yum! I just so happen to have some of these Kool Aid Easy Mix in my cupboard. This sounds like a perfect way to use them! It is, Paris! I love how I can now make it by the glassful. This looks so delicious and easy to make! My husband would love it! Of course, you can’t go wrong with kool aid! It’s the best this time of year, especially. It turned out even better than I imagined, Logan! This pie sounds so good! I love cream cheese! This pie looks so good. I will have to try that new Kool Aid out! I’ve never had a Kool-Aid pie before but it looks good! I’m going to have to try this sometime! Thanks for showing me the recipe! Now that’s a great idea, I can almost taste it! What a pretty looking pie- I love the pink 🙂 The cherries on top are a perfect touch as well. It sounds yummy! I have never seen anything like this before. I am sure my kids would love it for sure. Your family must be right because if you can make pie out of kool aid, then you are the best pie maker in the world! I bake pie once in a while but I always fail terribly lol. Yum! That looks so light and refreshing and easy to make! I love almost all kinds of pie! That’s such a delicious way to use Kool-aid. The cherry and the whipped cream on top are super cute. That pie looks great…I never would have thought to use Kool-aid in a dessert like this! Yum! Now this is different and looks super delicious! I would absolutely love to try this. I bet my kids would love it! Would like to try other liquid drink mix in this, too… Country Time Lemonade for lemonade pie. OH MAN. I love this already and I haven’t even had a bite out of it. Since i’m heading home in the next few days I should make this for my little nephews!!! Oh my gosh this looks delicious and so easy to make! I am definitely giving this one a try this summer – I already know its going to be a hit! This pie looks delicious! I bet you could also vary the recipe for any flavor! How awesome! That looks so sweet and delicious! I wish we had Kool-Aid here in Ireland so that I could make it for myself. I love anything with granadilla for summer but this looks so yummy! I’m definitely going to try it when summer comes this year. Kool-Aid, cream cheese and maraschino cherries? What’s not to love about this recipe! And your pics look awesome! This recipe rocks! That recipe looks awesome! I love the idea of Kool-Aid that just needs water, no adding sugar! Easy and delicious, just the way I like it! This pie looks so delicious and easy to make. I will have to try making one this weekend. My kids will love it. omg I think not only my daughter, but hubby too…. Would totally love this!!! A kool aid pie sounds so fun to make! It has been years and years since I’ve touched Kool-Aid. However, this sounds really interesting! I knew it would be good when you started with that graham cracker crust! I’ve used Kool-Aid in recipes also, it adds such a nice flavor and color too. Your pie looks scrumptious. Pinning. Now this reminds me of my childhood. I’ve always loved having Kool-Aid at school. Never thought you could make a pie out of it. So cool! I never thought of using kool-aid in a dessert like this! This is such a fantastic idea – would love to make this! thanks! You just made it easy! My wife always love pies, She would love this. I never used Kool Aid to bake before. What a smart and creative idea! Oh my gosh I love the color of the pie! The pink is so girlie and pretty for the spring/summer. Wouldn’t this make a pretty Mother’s Day pie? Oh and my hubby loves water enhancers too, so I’ll have to pick some of these up for him. I was wondering the same thing as Elizabeth Mason. I have made several of these and have made them in all kool aid flavors. The only flavor we don’t like is Grape, just because it tastes like medicine!! Luv all other flavors and they are a hit everywhere I take them!! Kool Aid in a pie – now this is something kids would love! Hi, Alli! Wanted to let you know that we loved this post you linked up last week at the #HomeMattersParty so much that we featured it this week! Check it out if you get a chance at http://theroadtodomestication.com/2015/05/01/home-matters-linky-party-35/ Happy Friday! This looks so good and what a fantastic idea. I bet it has a lot of flavor to it. I can not wait to try it and I hope you don’t mind but I pinned it too. Pin away! It’s my family’s new favorite dessert – and so, so easy! Just made this for Mother’s Day was so easy tried the filling when I was making is delicious can’t wait to serve it at the picnic tomorrow! I hope your family loves it as much as mine does! Happy Weekend! I made this for work. One of the girls grew up with this pie. I had never heard of it. I came upon this recipe and tried it two ways. Both were delicious! I could not find the liquid kool aid that was mentioned in the recipe so i used just one package of black cherry kool-aid along with an oreo crust. I mixed some chocolate shavings into the mix and added some on top of the pie. The pie came out great. I like that the cream cheese is added. I found other recipes without it and made the other pie without it. This one is the favorite at work. It came out firmer than the picture above because i didn’t use the liquid. Loved the texture. My co workers thank you!!! So many options in kool aid flavors!